I was asked what advice I might have for the parents of an addict from the addict’s sister.There have been books written about this and I will try to put some general thoughts together here. I thought about this quite a bit for the ten days I was on vacation as I don’t take any of this lightly and can only give my views as to what I feel I have learned through others and our experiences. My first thought is that this adult addict is definitely taking advantage of the parents and is being enabled. I believe that loving our children does not include enabling, it means keeping them accountable. Understand that this can be a very difficult assessment to make. Am I enabling or am I supporting? To me, enabling is giving the addict money when asked for it. Have I fallen for that one? I sure have and in my ignorance of how bad this disease is, I gave money when I probably should not have. I wonder how many times did I give money thinking it was for food, rent, or other necessities when it was actually used to buy drugs. These are some of the instances where I would now caution a parent against giving money. This includes paying for a car, car insurance, and gas. Remember that an addict may use a car to get drugs. We may think we are helping our child get to a job or to meetings. As far as the job goes, Ashley found that when all else failed, public transportation took her anywhere she needed to go as did her feet. It may not always be the most desirable means for getting from one place to another and sometimes it took her hours to get somewhere which, by car, would have been much quicker. We want our addicts to have a cell phone so they can communicate with us. I believe we fell into that trap too. When our kids are using, it does not matter if they have a phone or not. Most likely, they will be avoiding our calls but will use that phone to contact someone for drugs. Money for rent, utilities or a hotel. I don’t want my daughter on the street. I remember watching a woman pushing a grocery cart full of all her belongings along a sidewalk in California. I thought that if things did not change, that could be Ash. There was a time when she and the young man she was with stayed at a very run down hotel. She did not realize that they were homeless. After all, they had a place to stay. I think of her every single time we are feeding the homeless through the FACETS program. I can see her face on each woman lined up to receive a decent meal, knowing that could be her. While I have never been asked to bail Ashley out of jail, I would not do it. In the past, when I knew what was going on, I made her take the consequences. When she was in eighth grade, she came home from school and said some kid had lit a cigarette on the bus. I am sure I told her that was a stupid thing to do. The kid had a lighter, a cigarette, and was brazen enough to light it up on the bus??? So imagine the phone conversation the next morning. The principal from the middle school called and told me what had happened. I replied I knew as Ashley had told me about it. Then she hit me with it. The student who lit the cigarette on the bus was Ashley. I was shocked. I was angry. I had been duped. Ashley was suspended from school for a couple days. She thought it would be mornings to sleep in, watch tv, and read books. Not. Even. Close. I took time from my teaching job to be home, had her up and following the very same routine she would follow at school, complete with work. When Ash did try and come home to live, I told her she would have to have a job, pay rent and submit to random drug testing as well as attend meetings. My thought was, and still is, if she was not going to be responsible I may very well come home and find she had overdosed or was dead. I would not trust that an addict would live rent free in their parents’ home without bringing drugs in and getting high. I realize there may be exceptions if the addict is in recovery, but then part of that recovery would be to get a job and pay rent. She did find work but every single job ended with some excuse. Not enough hours. The manager was disparaging a worker and Ashley stood up for the worker and was fired. She could not find anything. Then was when I found the empty bottle of wine, what I thought was black heroin on a mirror and the positive on the drug test I had sent in. It was at that point I told her she had to leave. If you have read previous blogs, that was when Ash said I saved her life. I did my best to support and love her without enabling her. Her recovery is up to her. Sometimes we have to let go to get our children back. None of it is easy. It is heartbreaking and often terrifying. So, I would encourage the parents of this addict to reach out for help from others. There are groups online that have been helpful, like The Addicts Mom and The Addicts Dad. The Chris Atwood Foundation. Are there any friends or family members they would listen to who could let them know that their addict is most likely heading for an overdose or worse? Would they ever consider a family support group or has there been one offered from the treatment centers he has been in? 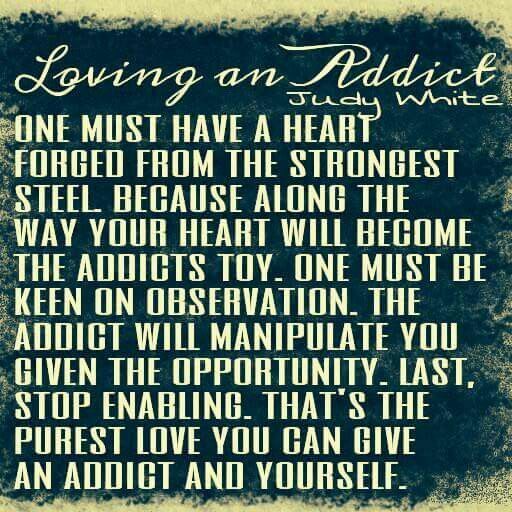 There is nothing more important to an addict than the drug. He will lie, cheat, and steal to support his habit. I have read too many memoirs now from parents of addicts and addicts themselves to believe it to be otherwise. I am sure Ashley will respond to this. Maybe parents need to hear it directly from another addict. For today, my recovering addict just arrived at work. She is still here. Still helping. Love her.